As soon as the Birdemic Experience World Tour 2010 came to an end in July, Director James Nguyen (aka The Master Of The Romantic Thriller™) hit the ground running in preparation for his much-anticipated followup to the cult hit Birdemic: Shock And Terror. Titled “Birdemic II: The Resurrection“, the pic is set in Hollywood and Nguyen plans to produce the film in 3D, which has garnered early buzz across the internet. Nguyen has kept the Severin staff up to date with the latest developments in the sequel’s plot (sorry no teasers at this time, but take my word for it, its terrific), casting, and pre-production. The most interesting update as of late is Nguyen’s D.I.Y. 3D rig, which is further evidence of his unique ambition, which I wrote extensively about here. I had a chance to grab a quick interview with the diligent filmmaker in between further pre-production work on his sequel. Evan: What inspired you to want to make Birdemic II: The Resurrection in 3D? Because of the success of the cult sensation hit movie, Birdemic: Shock And Terror and the many requests from many Birdemic fans of the sequel, Birdemic II: The Resurrection 3D. Even more, I thought it will be really cool, even more “Shock and Terror” in 3D and more entertaining to produce the sequel in 3D. And lastly, the romantic thriller, Birdemic II: The Resurrection 3D has a great storyline that compells and motivates me to want to direct it! Walk us through how you built your 3D rig, and how does it work? 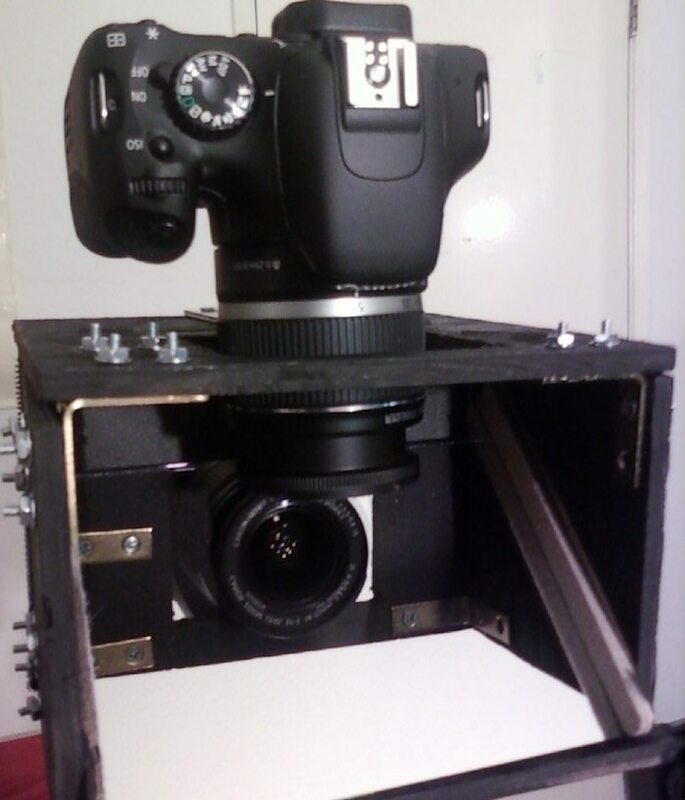 A 3D beam splitter rig is an adapter that makes it possible to film in 3D. Two cameras are required to film in 3D. My 3D beam splitter rig is constructed from wood and a mirror: a beam splitter (50% reflection, 50% transmission). First, a square enclosure is constructed. Then the beam splitter is position and placed at a 45° angle in the enclosure. Then one camera is placed on top and facing down at the beam splitter and the other camera is placed under the beam splitter facing with the front view. The 3D movie is created from two images: left camera and right camera. In post production, the two images are aligned with the 3D visual effect and then it is output as a 3D movie. The 3D beam splitter rig is meant for filming in closeup and medium shot in 3D. For wide shot, a side by side layout is used with two cameras. How will you use 3D in the sequel? The 3D effect will be used to make the eagles and vultures even more “Shock and Terror”! Can you vision of those eagles and vultures jumping out of the movie screen as they come at you with their sharp claws and toxic flammable bird fluid drops in 3D? Explosions, cars, bullets and objects like people’s heads, body parts will be coming out of the movie screen and at the audience. I can’t wait! Do you have any favorite uses of 3D in Hollywood? My favorite 3D Movie is James Cameron’s Avatar. ← NewerHAPPY HOLIDAYS FROM SEVERIN FILMS!